A scarce early map of the Entrance to the Chesapeake drawn from original survey work by Mark Tiddeman. A Draught of Virginia from the Capes to York in York River and to Kuiquotan or Hamton in James River. 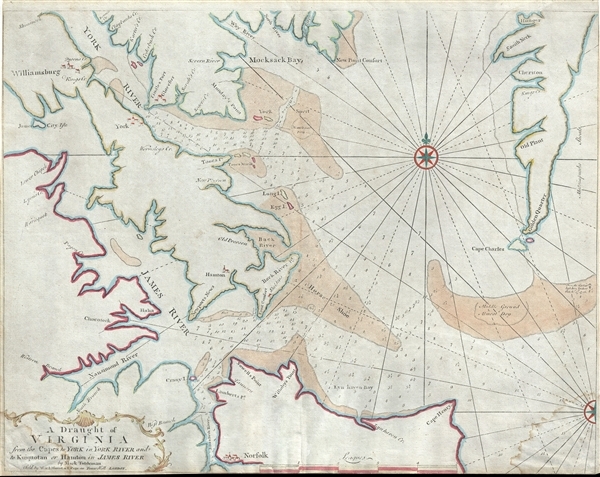 An important c. 1755 map of the Chesapeake Bay entrance by Mark Tiddemen. Oriented to the north, the map covers from the York River and Williamsburg to Norfolk and from Williamsburg to Cape Charles. It includes the mouths of the York River, The James River, the Nansemond River, the Elizabeth River, and Mockasack Bay. It notes the towns of Williamsburg, Norfolk, Newport News, Hamton, Sheldens, Old Pecoson, York, Gloucester, Tindles Fort, etc., Tiddeman personally surveyed this map between 1724 and 1728, when he served as master of the British ship Tartar. Evidence of Tiddemen's presence in the regions is printed on map itself where a notes reads 'Here the Tartar lost her anchor, October 17, 1726.' As the direct result of unique survey work, Tiddeman's map was the most advanced map of the region available at the time of publication. Tiddeman`s logbook survives in the British National Archives and includes notes about the Tartar stopping and inspecting ships encountered along the coast, suggesting that his mission in the area may also have included compliance checks to enforce British customs laws. It thus represents an important step forward in Chesapeake bay cartography, being more advanced than the Augustine Herman map of 1669 but not as detailed as the Hoxton amp of 1735. The present map corresponds to Verner's state 2. The state can be identified for the omission of a fleur de lis on the right compass rose a various corrections including the revision of 'Horse Shooe' to 'Horse Shoe.' It was published in various Mount and Page editions of The English Pilot, the Fourth Book. Mark Tiddeman (fl. c. 1724 - c. 1760) was a British navigator, surveyor, chartmaker, and hydrographer active in the early 18th century. Tiddeman was sailing master of the English sailing ship Tartar. From 1724 to 1728 he completed a hydrographic survey of New York Harbor and the mouth of the Chesapeake. These surveys were eventually adopted by Mount and Page for inclusion in the 1732 fourth book of the English Pilot. On returning to England Tiddeman completed several surveys of the Highlands of Scotland for Admiral Wagner, who was then stationed on the Coast of Scotland. On March 27th of 1741 he was commissioned as a Lieutenant in the Royal Navy. He later became a Captain and piloted several ships to and from the British West Indies. Mount and Page (fl. 1701 - 1760) was a London based firm of religious and maritime publishers that flourished in the 18th century. With the publication of the 1732 English Pilot, the Mount and Page name became well-known worldwide as an imprint of nautical charts. The firm was founded at Tower Hill, London, in 1701 by Richard Mount (1654 - 1722) and his apprentice Thomas Page (1780 - March 15, 1733). Mount had previously been in partnership with his father-in-law William Fisher (1631 - 1691) and inherited the business on the latter's death. Page completed his apprenticeship in 1716. Now fully partnered, Mount and Page subsequently acquired the map plates several defunct British nautical chart publishers, including Greenville Collins, Jeremiah Seller, Charles Price, and John and Samuel Thornton - thus nearly monopolizing the British nautical chart business. The firm consequently received several lucrative government contracts and thereby flourished throughout the 18th century, making the fortunes of both families. Successive generations of Mounts and Pages worked in the business, and the families intermarried. Its staple titles were The English Pilot and Navigatio Britannica by John Barrow. By the 1760s, Richard Mount's grandson John Mount (1725 - 1786) was able to retire to Berkshire where he built the stately mansion, Wasing Place. John's son William (1753 - 1815) was the last to work in the map business, and later generations went into politics. Good. Bottom, right, and left margins trimmed to neat line. Water stains, left and right bottom corners - easily washed out by a professional restorer. Backed on archival tissue. Verner, C., Carto-Bibliographical Study of The English Pilot, the Fourth Book, pages 55-69. Boston Public Library, Leventhal Collection, G1106.P5 E54 1737.